I have been looking forward to reading this book for some time and had kept it aside to read in one sitting. I was not disappointed. 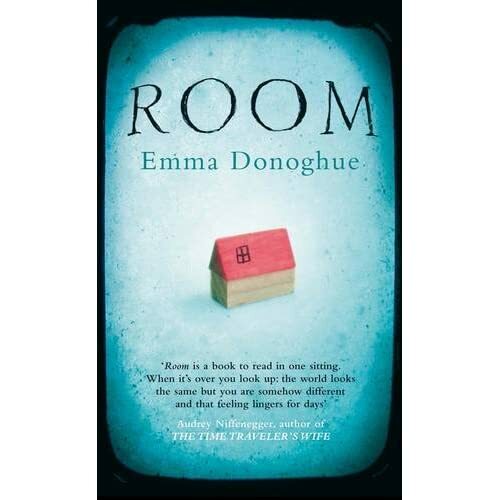 The story is told from the perspective of a 5 year old boy who has been locked in a room with his mother from birth and is unaware that there is an outside world. Sounds depressing ? Oddly it isn’t. The child’s voice makes the whole experience both fascinating and endearing. Inanimate objects are his friends, hence he refers to ‘rug’,’wardrobe’ and ‘bed’ and anything that he sees on the television is seen to live only in the t.v. As the story unfolds his mother explains to him about the outside world and we live through his bewilderment and attachment to both his mother and the place he knows as home. The Middle section of the book is gripping and fast paced , real edge of your seat stuff. The final 2 sections describe beautifully the child’s uncertainty in a big new world and his observations of the futility of modern consumerism . It made me consider what is really important to children.. They don’t need ‘things’ or to be taken to lots of places what ultimately matters is security , love , and routine. It is a wonderful thought provoking read and I can’t recommend it highly enough. Previous Post‘Can I sing on the microphone?’ Recording children’s voices.Next PostParenting – the most difficult job in the world?